The Golden Globes were last night...which means it's time for a best and worst dressed recap on TSF. Ready? Okay! Yasss Kween! I've never seen an illusion neckline look so...well...so real. It blends with her skin perfectly. She is a bombshell in this blushy pink color and the red lip is the icing on the cake. Brava! You'll see that this season was one for black dresses with plunging necklines. I loved that Rachel wore a plunging neckline and she actually has a fuller chest. A lot of women who wear these have smaller chests so Rachel is showing how to do it well for the big-busted ladies. I'm also a sucker for scattered patterns like the floral accents in her dress. I love, love, LOVE this color on her. And I love that it is straight up sequins. 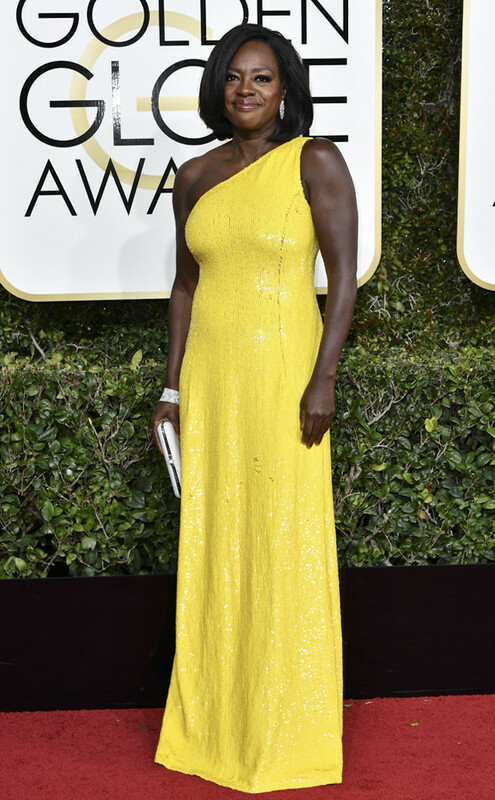 Not many people can pull off banana yellow sequins but she's got it in the bag. The one-shoulder cut accentuates her toned arms and shoulders. LOVE! I think this dress is actually navy but it follows the trend of dark, deep-V necked dresses. I love the addition of the "cape" on the back and her hair and makeup are perfect. She looks her age...not too young or too old...which she has a tendency to do on the red carpet. I picked her simply because this was an unusual silhouette for the red carpet. I've not seen a squared off plunging V-neck and I really liked it. The banding around the V gives the dress interest. She nailed it! Girl, wut dis is? I'm digging the color and the illusion neckline but it's just too much. The cutout V chest and the weird unconnected sleeves are too much. Remove the sleeves and I wouldn't hate so much but I really hate the entire look. I really have no words. This is ombre hair gone bad. This is eyeliner gone bad. This is trying to be avant garde gone bad. Her hair is severe (Queen Elizabeth I style) and the eye makeup is much too dark. She needs lips and this looks like a prom version of an Elizabethan style gown. PEOPLE STOP WITH THE WEIRD SLEEVES ALREADY. Um, I don't hate the top 1/4 of the dress. The neckline is interesting and cool but the middle part around her waist doesn't fit very well and makes her look boxy. She needs it to be more cinched to balance out the wide shoulders. This one was totally a fit choice. Girl, what? First, I'm sorry, this dress is too young for her. The sleeves are ridiculous (again with the sleeves people?) I don't hate the color on her because the gray is pretty but I would have liked it much better were it not transparent and see-through in certain parts. Oh and if it didn't have sleeves. Kristen Bell looks fierce! Great recap. What the HELL Sarah Jessica? I almost always watch awards shows and red carpets, and the GG is usually my fave, but I missed it this year, so thank you for the recap. From the pics I'd seen, Viola Davis was a resounding YES!!!!! for me. I think Kristen Bell looks exceptional as well. I know, I know...I'm going completely against anything that anyone with any sense would say, but I don't hate Nicole Kidman's sleeves. ha.